For over three decades My Sisters’ Place has worked tirelessly to address the problem of homelessness in the Greater Hartford area. During this time, the organization has proved time and time again that its possible for those who slip into homelessness to step out into a bright new future of self-supported independence. But we can’t do it alone. As a non-profit agency, the support of those in our community is critical to the success of our mission. Our greatest need is for people like you to make a commitment to helping the homeless through generous and consistent donations. 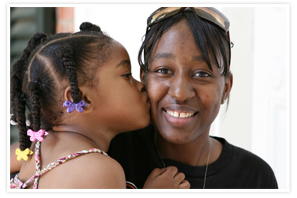 Donating a tax-deductible gift to be applied to one or more of My Sisters’ Place programs. Pledging a predetermined, tax-deductible dollar amount on a regular basis to My Sisters’ Place. By including a gift to My Sisters’ Place in your overall estate or financial plans, you will help ensure that we have the resources available to continue the quest to end homelessness. Inquire about our current wish list, which typically includes baby items (ex., disposable diapers, formula, bottles) and household items in good condition. Please contact us to find out our specific needs. Donating holiday gifts. Please contact us before the holiday to get complete details of our needs. Volunteering your time. Click here to learn more. Learn more about homelessness and the many ways you can help in the fight to end this ongoing issue. Click here to make My Sisters’ Place your Amazon Smile Charity!